The 10TCRT is available as a replacement part. 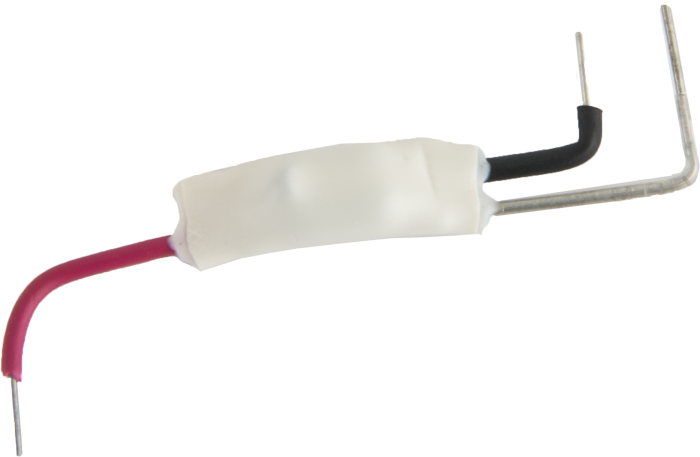 This external thermistor provides a reference temperature for thermocouple measurements. The 10TCRT is only compatible with the silver CR10 wiring panel. The leads are too short for either the black CR10 wiring panel or the black CR10X wiring panel. The 10TCRT is an external thermistor that provides a reference temperature for thermocouple measurements. The leads of the 10TCRT connect directly to channels 1H, E3, and AG on the CR10 Wiring Panel. The thermistor and resistors are attached to a small printed circuit board. An aluminum thermocouple cover (pn 10630) reduces thermal gradients across the analog inputs.